Fifield project, 1822-50 W. Chicago Ave.
Ald. Proco Joe Moreno stated that the Fifield Cos. can build 39 units as of right, but the new plan is to upzone for 59 units. The Fifield position is: We can do more bedrooms at the higher zoning but we’re not, and we can do a higher floor-area ratio but we’re not. Fifield does not feel it can build a connection to Commercial Park as requested at the last EVA board meeting. Fifield wants to build a larger building than allowed, so the law requires on-site affordable units on-site or a donation to the Chicago Low-Income Housing Affordable Trust Fund. Fifield wants to make a donation to the fund. The city has determined that legally this donation cannot be a space donation to a nonprofit, as EVA has discussed. Moreno expressed a general concern with developers donating to the fund instead of providing affordable housing, absence extreme circumstances, although he acknowledges it's allowed. Although the city declined to allow a donation to a nonproft, Moreno would like to explore that idea for future projects. Moreno believes expanding Commercial Park to the Chicago Avenue sidewalk at this location would be a "real big win" and he will dedicate money to park expansion if that happens. He believes about 4 or 5 weeks is needed to see if the Park District can acquire the property. Ronda Locke stated that a meeting with the Trust for Public Land has been scheduled and the Park District has been keeping Locke informed of its progress. Locke is working to get all stakeholders in one room for a meeting. Locke believes 4-6 weeks is needed. 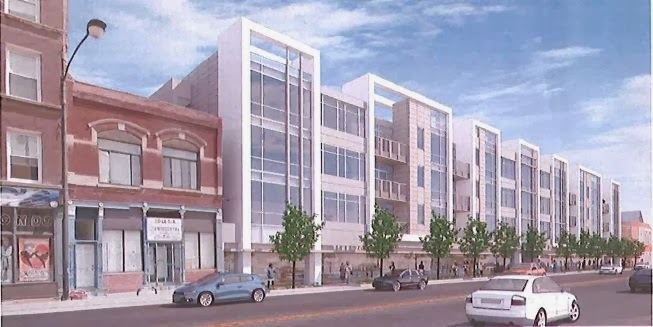 Board members expressed some concerns about the Fifield project to Moreno, including a concern that the donation to the fund appears to be “zoning for sale.” Board members also expressed an interest in the creation of affordable housing in East Village. Moreno advised EVA to balance benefits from a larger project versus Fifield building as of right. He would like to give the park expansion 4-5 weeks. If acquisition isn’t happening, we will need to look at this issue again. If upzoning happens, he advised pursuing Type I zoning. Moreno supports the new Forbidden Root proposal, an upzone from B to C and a lift of the tavern liquor moratorium running from Ashland to Wood for one year. Moreno stated that he realizes he has a history with EVA, a 2-year agreement was made a year ago, and the agreement means something. However, he stated “I think it would be fantastic for the neighborhood.” Moreno believes that the “all or nothing” liquor moratoria are outdated compared to the proactive Plan of Operation now attached to liquor licenses at the start (rather than as problems arise). Regarding zoning, Moreno indicated that small urban distillaries are the new economy, rather than traditional manufacturing such as steel mills. Board members expressed concern about the inconsistent zoning change and questioned the level of effort made to amend the ordinance rather than lift the moratoria. Convenience stores might come in if the package liquor moratorium is lifted, and more property owners possibly would also seek to upzone from B to C. There was some frustration that Forbidden Roof would not need these changes if operating as a restaurant. But discussion also noted that Moreno has lifted moratoria in Logan Square and no problems have resulted and that there have been no problems with Garden Gourmet (although several board members have reported conditions that contradict its Plan of Operation). Forbidden Root has been open regarding its plan and working well so far with EVA on a Plan of Operation. It was also suggested that other businesses at that parcel may be more disruptive to the neighborhood, and that the space has been empty for an extended period. Moreno pointed out that if Forbidden Root violates any Plan of Operation attached to its liquor license, it can lose that license. In addition, the zoning ordinance provides protection. He also points out that there's currently no other C property in that liquor moratorium area, and both Chicago Grand Neighbors Association & EVA would be consulted were there such a request. Moreno noted that larger taverns are causing problems in the ward. Fifield is an experienced developer asking for EVA support to build a larger project than what they now can build. As of right, they can build 27 units with a 2.2 floor area ratio. They want to build 59 units with a 2.29 FAR. In addition, they could build: 111 bedrooms, but only want to build 107 bedrooms. Fifield noted that if they build as of right they will not pay into the low-income housing fund, but if they upzone there'll be a donation to the fund. They would like the donation to go to Commercial Park if possible. After discussions with the board, Fifield has reworked the green wall, garbage placement (now inside bldg), parking/ traffic flow and design of the back of the building (which will now look similar to the front). Final design has not yet been selected because of a decision not to use split-face block. Fifield noted that the building will be professionally managed and units will be priced as low as $1,250 for a studio. Fifield noted that there will be no roof deck and no big lights. The unit mix will be 5 studios, 18 1-bed, 24 2-bed, 12 3-bed (59 units, 107 bedrooms total). As of right units can be very large and therefore more expensive. They noted that they cannot qualify for tax credits since the units will be market rate. Fifield will repave the alley and will explore permeable paving. The company plans to use green building and design techniques to meet LEED certifications, but Fifield does not plan to have it certified. In conclusion, Fifield asked for the EVA board support and to give a full presentation at the May 5 general membership meeting. Forbidden Root presented its current proposal to use the building for its headquarters. The space on Chicago Avenue will have brewing, serving and sales of package liquor (only Forbidden Root products). Brewing will be in back, space for 150 people will be in front. Also in front will be a few small coolers for package sales. Forbidden Root will rezone from B to C with Type I restrictions, plus a moratorium lift and a tavern liquor license with an attached Plan of Operation. Forbidden Root may ask to lift the package liquor moratorium and apply for a package liquor license at a later date. The Plan of Operation attached to the tavern liquor license will include restrictions such as hours, amount of beer being brewed, occupancy, signage, truck routing, salt on the sidewalks, safety monitoring, and reporting trouble to police. EVA is still expecting to provide additional comments on the Plan of Operation. Forbidden Root tried to create an amendment to the package liquor moratorium basically allowing sales incidental to brewing operations. Moreno presented the amendment, but Liquor Commissioner Greg Steadman would not support the amendment, fearing it would “water down” the moritoria and cause many new license issuances citywide. The brewery acknowledges that if both the package and tavern moratoria are lifted, businesses on other parcels in the moratoria area would not be able to get tavern liquor licenses, but they could (with B zoning) get package liquor licenses. Therefore, Forbidden Root is “holding off” on requesting a package liquor license. It believes the amount of package liquor sales under their current plan is “incidental to tavern operations,” and so a package liquor license is not required. Forbidden Root asks EVA to agree with Moreno and lift the tavern moratorium on Chicago Avenue from Ashland to Wood. The board asked questions about the amount which Forbidden Root and its landlord are investing in the structure (about $2.5 million), when it will open if EVA agrees with the upzoning and moratorium lifts (6-9 months), the term of the lease (5-year periods with 2-4 renewals available), the primary location of package sales (off-site), the price point for beer (about $11 for a 4-pack), the source of the beer to be served on-site (kegs of year-round “flagship” beers from off-site delivered about once per week, plus special beers brewed on-site), why the proposed ordinance was written so broadly (Forbidden Root expected to negotiate away what they did not really need). Fifield: The Planning, Preservation and Development committee will make a recommendation. Forbidden Root: Neal McKnight will ask the board to vote by email: Does the board want to submit this question to the general membership? Should EVA release the alderman from the agreement as to the tavern moratorium? There will be no business minute. Fifield will present. McKnight noted that the donation to the fund by Fifield will be $200,000. Forbidden Root will also present at the meeting. The board will go over voting rules in the bylaws at the May 5 meeting. The board will try to ensure that a copy of the bylaws is present at every general membership and board meeting. Started 6:10pm, adjourned 8:15pm at West Town Branch Library, 1625 W. Chicago Ave. Board member attendance: Neal McKnight, Dan Johnson, Catherine Garypie, Gladys Alcazar-Anselmo, Meghan Delong Quinn, Tom Tomek; Ald. Proco Joe Moreno.